Observations show a multidecadal signal in the North Atlantic ocean, but the underlying mechanism and cause of its timescale remain unknown. Previous studies have suggested that it may be driven by the North Atlantic Oscillation (NAO), which is the dominant pattern of winter atmospheric variability. To further address this issue, the global ocean general circulation model, Nucleus for European Modelling of the Ocean (NEMO), is driven using a 2,000 years long white noise forcing associated with the NAO. 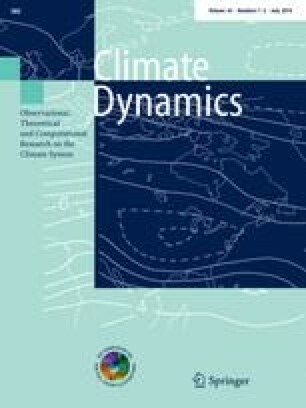 Focusing on key ocean circulation patterns, we show that the Atlantic Meridional Overturning Circulation (AMOC) and Sub-polar gyre (SPG) strength both have enhanced power at low frequencies but no dominant timescale, and thus provide no evidence for a oscillatory ocean-only mode of variability. Instead, both indices respond linearly to the NAO forcing, but with different response times. The variability of the AMOC at 30°N is strongly enhanced on timescales longer than 90 years, while that of the SPG strength starts increasing at 15 years. The different response characteristics are confirmed by constructing simple statistical models that show AMOC and SPG variability can be related to the NAO variability of the previous 53 and 10 winters, respectively. Alternatively, the AMOC and the SPG strength can be reconstructed with Auto-regressive (AR) models of order seven and five, respectively. Both statistical models reconstruct interannual and multidecadal AMOC variability well, while on the other hand, the AR(5) reconstruction of the SPG strength only captures multidecadal variability. Using these methods to reconstruct ocean variables can be useful for prediction and model intercomparision. We thank to two anonymous reviewers, and Mojib Latif for their helpful comments. The work was primarily supported by the Deutsches Forschungsgemeinschaft under the Emmy Noether Programm (Grant KE 1471/2-1). We would also acknowledge support from GEOMAR, the EU-THOR (No. GA212643) and EU-STEPS (PCIG10-GA-2011-304243) projects, and the Norddeutscher Verbund für Hoch- und Höchstleistungsrechnen (HLRN) computing facility. GEOMAR TM Group and DRAKKAR consortium provided support with various modelling aspects. where, ω is the frequency and σ 2 is the variance for the time-series x(t).